A few more interesting pieces of information about Chitabe Camp and then I'll get into the details of the incredible wildlife sightings we enjoyed there. First, when we arrived at the camp a group of the staff were waiting to greet us and they were singing. I don't know what the song meant because it was in Tswana but I am guessing it was some kind of a welcome song. The staff also sang to us before dinner and the songs included what I later found out is called a chortle which is a sound that is a cross between a yodel and a yee haw that a cowboy might yell. It is meant as a sound of joy. Very cool! For our first morning game drive we were woken up before dawn. The method of wake up used was the guide walking up to the tent and yelling, "knock knock." He also delivered hot water for us to make tea and coffee and then came back and collected us to walk together to breakfast at the lodge. You will remember that we were not allowed to walk on our own in the dark. There was a full breakfast. The game drives at Chitabe are longer than what I am used to. At other lodges we have visited a morning drive takes place from about 6:00 or 6:30 until 9:00 or 9:30 and then you eat a full breakfast when you return. At Chitabe the drives started at 6:30 when the sun was just rising and and continued until 11:00. Brunch was served at 11:30, high tea at 3:30 and then dinner at 7:00. Each game drive also included a stop for coffee in the morning a sundowner (meaning adult beverage) in the afternoon with a snack. So there is little chance of starving. For the morning drive we were again teamed up with the other two American couples and the six of us headed out with BB. Within five minutes of leaving camp we saw two male lions walking on the road. We were so close to them! BB followed them and as guys will do they led us right to a pack of females. 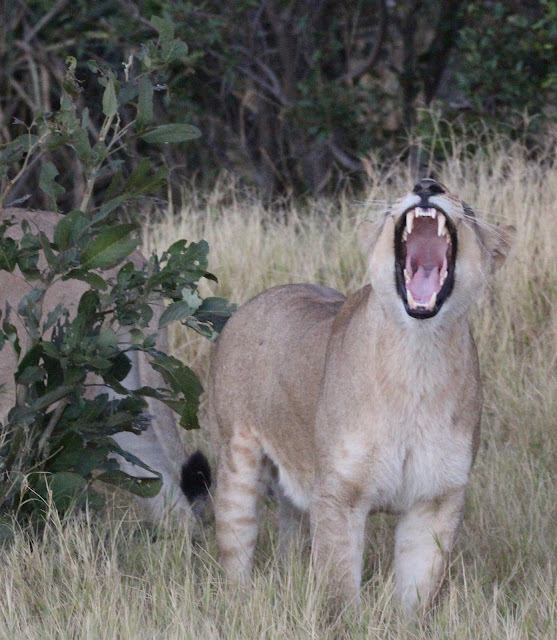 Female lions are the ones who do the hunting and it soon became clear that at least one of the lionesses had spotted a lone buffalo. We watched her stalk him for a while and it was quite intense. The couple from New York sitting behind us were so excited. This was the last day of their trip and they were ready to see a kill. The wife was whispering things like, "oh my God the lion is going to kill that buffalo" and the husband was whispering things back to her such as "please be quiet" and "stop talking." You will notice this one has two different color eyes. I didn't see it until we returned home and I examined the photos. I was excited as I thought I captured a rare trait. But then someone suggested that maybe something was wrong with her blue eye. I am not not sure, but it does look cool. Female stalking and a photo below of the hunted. Lots of buffalo nearby and some yawning. The lioness made a half assed attempt to run at the buffalo but for some reason her heart wasn't in it. Although lions are the kings and queens of the jungle it turns out they are not always the greatest hunters. Sometimes they lose patience too quickly and their kill success rate is actually not as high as you would think. When the buffalo ran off we followed and were led right to a giant herd of buffalo. It's a good thing the lioness didn't try to see her efforts through or within seconds the predator would have been surrounded and would have become the hunted. 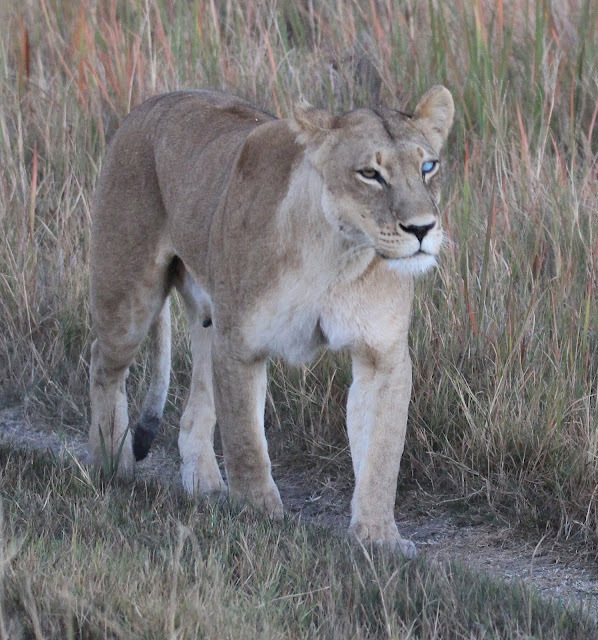 Later, we saw another lioness make a run at a warthog but she was also not successful. We dropped the New York couple off on the side of the road where they were picked up by another vehicle and taken to their plane and then we remaining Americans continued on. We thought we were going back to the lodge but instead we stopped in the bush and were treated to a gorgeous lunch right there in the wild. The staff had come out and set up a full bar and buffet complete with table cloths. It was really beautiful and a wonderful surprise. These kind of special moments continued throughout the trip. Wilderness Safaris really outdid themselves with these touches of creativity. Who doesn't want to stumble upon this when out in the bush? Our afternoon game drive was kind of quiet. Or maybe it just felt quiet after leopard sightings the night before and lion sightings and failed kills in the morning. More Chitabe fun and our travels to our second camp coming in my next post.